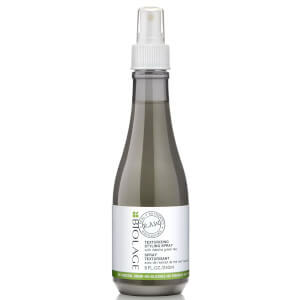 Achieve enviable texture with the Biolage R.A.W. Texturising Styling Spray; a convenient styling mist that offers coveted beachy waves. Effortlessly spritzing over damp locks, the Matcha Green Tea infused formula works to separate and define locks for a texturised finish. The styling spray can also be misted onto dry hair, which adds additional texture before styling. Transforms lack-lustre tresses and leaves hair soft with touchable texture and movement. Shake before use. On damp hair, spray evenly. Tousle and let air-dry or use a diffuser. For added texture, spray on dry hair. Style as desired.